4 oz. 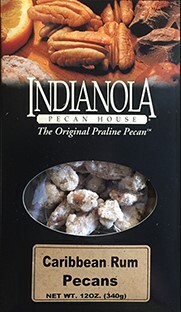 box Sea Salt Roasted Pecans - these are a very flavorful selection of our gourmet pecans! Try with praline pecans! Our sea salt roasted pecans are the perfect salty snack! Give our gourmet pecans to someone you appreciate today! Try these Carribean Rum Pecans!